“The chances of success have improved compared to the first and second attempts, because both Korea and Russia have removed all possible causes of failure,” the Ministry of Education, Science and Technology said…. There will be no further attempt if this launch also fails, and the Naro project will come to an end. The government already started developing a launch vehicle independent of Russian technology in 2010. It plans to develop a 75 ton rocket engine on its own with a budget of W1.55 trillion (US$1=W1,111) by 2021. 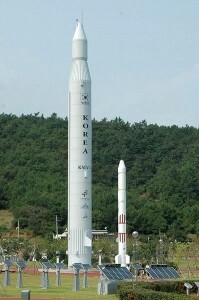 The goal is to produce Korea’s own space rocket which is capable of sending a 1.5 ton satellite into orbit. The Naro-1 (aka, KSLV-1) rocket uses a Russian first stage that is derived from that country’s Angara rocket and a South Korean upper stage. The first launch failed after the payload shroud failed to separate. The second rocket exploded during ascent.